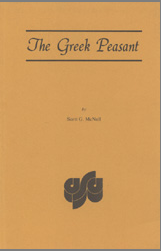 The book "THE GREEK PEASANT" by Scott G. McNall, was published in 1974 by the American Sociological Association. Below you will find the Table of Contents along with a list of the 75 Greek names mentioned in the book. You can view the 75 names mentioned in this book, along with the Table of Contents below. As I have done in the past, I borrowed this book through my local library inter-library loan program. PART TWO - Growing Up In A Greek Village, III) The Family, Honor, Pride and Shame (Birth. Becoming Male or Female. Greek Values. Changing Roles and Life Styles. Death); IV) School (The National Educational System. Schools in the Villages); V) Family Responsibilities (Marriage. The Dowry. The Changing Function of the Dowry); VI) The Job (Daily Routines. The Changing Seasons. Alternatives to Farming. Values and Jobs); VII) Dispensing Grace (The Priest. Folktales and Festivals).